One of the unique affordances of virtual reality is its power to convey the vastness of scale, which can invoke feelings of awe. 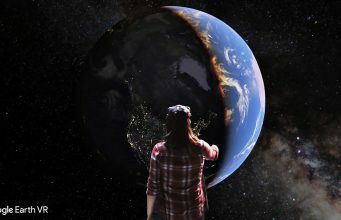 Denise Quesnel is a graduate student at Simon Frasier University’s iSpace Lab, and she has been studying the process of invoking awe using Google Earth VR. She was inspired by Frank White’s work on The Overview Effect, which documented the worldview transformations of many astronauts after they observed the vastness of the Earth from the perspective of space. Quesnel wants to better understand the Overview Effect phenomenon, and whether or not it’s possible to use immersive VR to induce it. Anecdotally, I think that it’s certainly possible as I reported my own experience of having a virtual overview effect in my interview with Google Earth VR engineers. Quesnel won the best 3DUI poster award at the IEEE VR conference for her study Awestruck: Natural Interaction with Virtual Reality on Eliciting Awe. I had a chance to catch up with Quesnel at the IEEE VR conference in March where she shared her research into awe, how it can be quantified by verbal expressions, chills, or goosebumps, and how she sees awe as a catalyst for the transformative potential of virtual reality. The post Using Google Earth VR to Study Awe – Towards a Virtual Overview Effect appeared first on Road to VR.